The City InMotion experience was a part of the NEVS stand during the CES Asia 2017. 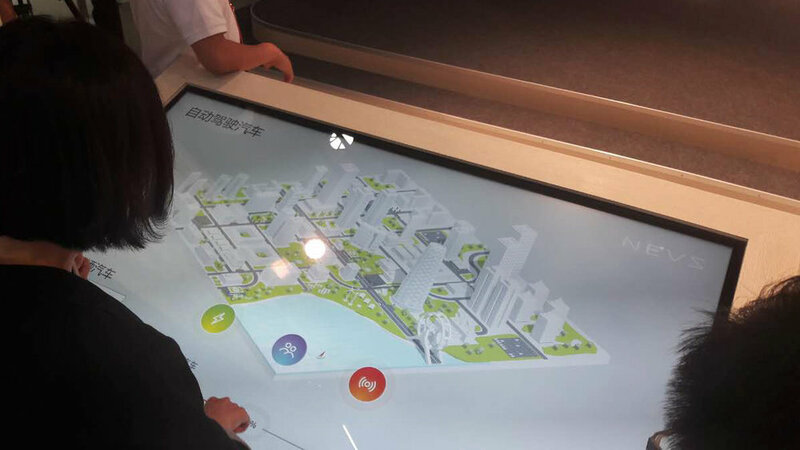 On a 65" touch display the experience was telling a story of how a future city could be like according to NEVS. In the NEVS stand you could change the amount of each of these three parameters and see how it would effect the city environment and traffic. A 3D city with live traffic illustrated the impact the future can have on a city. 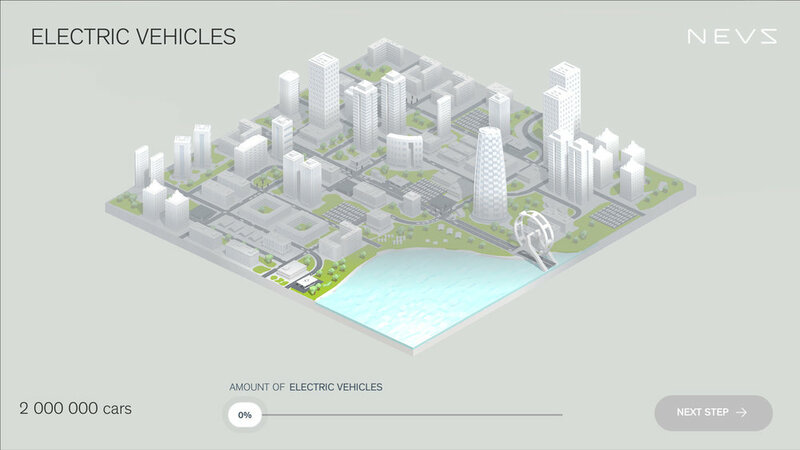 Less traffic, no traffic jams, better air and no need for parking lots are just some of the things that the NEVS future can bring. In the experience the city changed with a lot of small, smooth animations and the traffic became more smooth and lighter. The user could play around with the experience to see how all the different combinations would change the city. The user could also easily get more informations about what effects electric, autonomous and shared cars will have through pop-up windows. NEVS interactive table, City InMotion, has won a prestigious prize; the Red Dot Award Communication Design 2018. 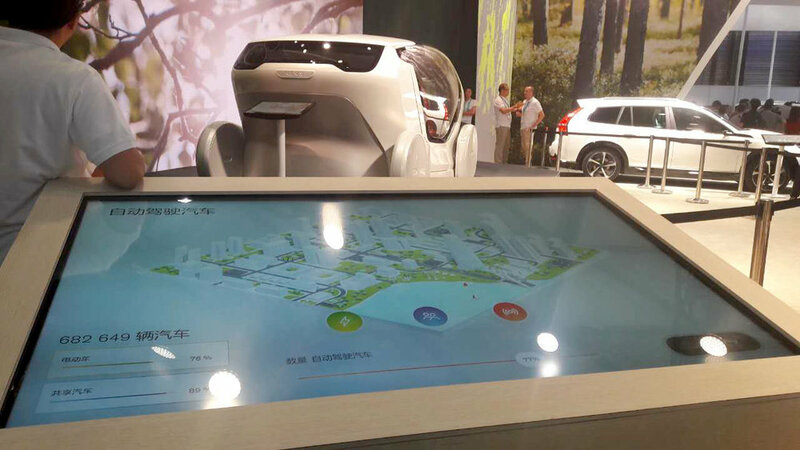 At the CES in Shanghai 2017, Asia’s leading tech event, NEVS launched the InMotion concept car; an autonomous vehicle that attracted a lot of interest among visitors. 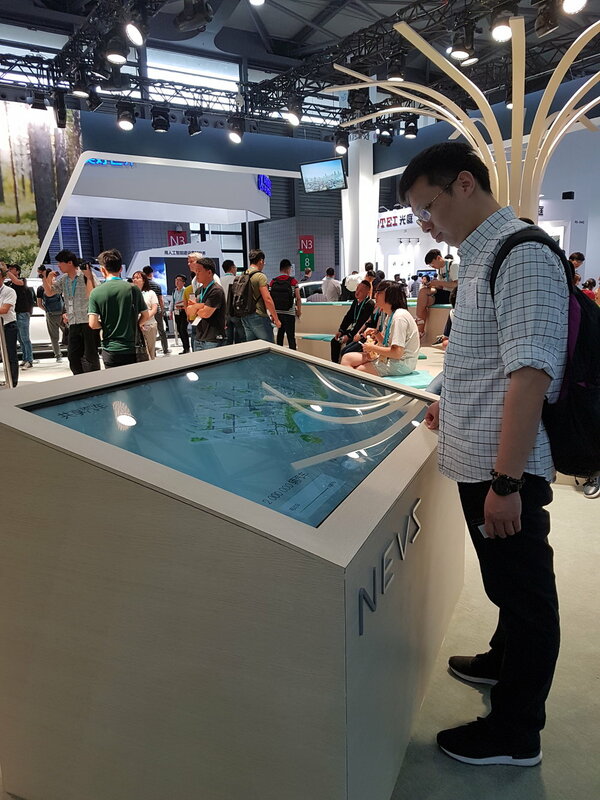 In connection with the concept car, NEVS also launched an educational digital table, where the visitors could see, experience and understand what NEVS meant with the offer “city solutions” and the vision “shape mobility for a more sustainable future”. At the interactive table you can see how the green areas in a city will grow as the cars are getting fewer and fewer, as a result of growing shared services, instead of private cars. In the same way, the air quality will improve as the traditional cars are replaced by electrical vehicles. The 24 international jury members of the Red Dot Award Communication Design 2018 have looked into more than 8 600 entries from 45 countries and come up with the conclusion that NEVS City InMotion was the winner in this category. “The Red Dot Jury convened for several days to assess, discuss and evaluate the entries professionally. They only award our sought-after Red Dot seal of quality to designs that win them over with good design and creativity. This means that you can be especially proud of your award”, says Professor Dr Peter Zec Founder and president of Red Dot. “We are really honored to get this award. It shows that we are on the right track with our ambitions to work for a more sustainable future and to explain it to the audience”, says Jonas Hernqvist, Vice President Sales & Marketing at NEVS. The interactive table was developed together with the agency The Techno Creatives in Gothenburg. The Techno Creatives works with design and technique to drive digital innovation for customers in the automotive business. In this case, the aim was to have the visitors interacting with NEVS brand and hereby understand NEVS vision. It led to the choice of the physical unit, the digital board, and to how complex the interaction should be. “I’m really proud of the collaboration between the team at The Techno Creatives and NEVS. One can only reach such a high level of quality when the customer is willing to push the boundaries of user experience and design together with their partners”, says Noel Braganza, Design Director at The Techno Creatives. The award will be handed over to the winner at a ceremony in Berlin on October 26. Founded in 2012 after acquiring the assets of Saab Automobile AB, NEVS seeks to shape mobility for a more sustainable future through a global portfolio of fully electric premium vehicles, mobility solutions, and sustainable city offerings. NEVS’ head office and main research and development facilities are located in Trollhättan, Sweden. NEVS plans to deploy electric autonomous vehicles in the early 2020s, both in the EU and China. The company is now preparing for large volume production of the NEVS 9-3 EV in its new production plant in Tianjin, China, by the end of 2018. The company will also soon establish another production plant and innovation center in Shanghai, China. NEVS is the first joint venture company with investors from outside China that has been granted a New Energy Passenger Vehicle Project investment approval by the Chinese government. In October 2017, NEVS and DiDi Chuxing, the world’s leading mobile transportation platform, formed a strategic partnership and finalized a number of steps towards an extensive cooperation. In April 2018, DiDi Chuxing, NEVS, and other companies collectively founded the “D-Alliance”. The alliance will build up a new ecosystem of automotive operations, promote car sharing, and drive forward the transformation of automotive industry towards smart mobility and new energy together. NEVS is an abbreviation of National Electric Vehicle Sweden.